EMC has been working with teachers at St Michael’s School High Wycombe as part of our project on group work – ‘It’s Good to Talk’. Head of Department Richard Long has, for many years, used blogging with his classes, as a way of sharing experiences in the classroom and a medium for writing that goes beyond the conventional essay or analytical response. When we worked with him and his Year 7s on poetry their blogging became an integral part of their responses to the poems and the lessons. 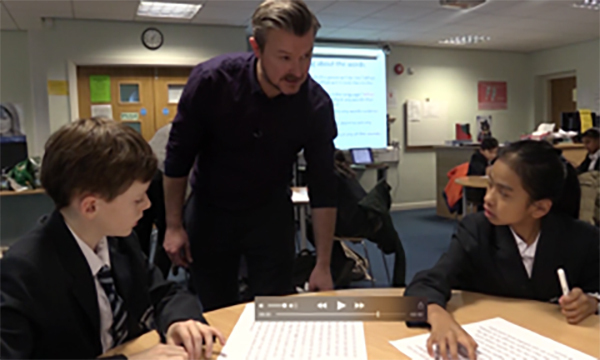 Here Richard explains how he uses blogging with his classes generally, and gives a flavour of the writing that emerged from the poetry lessons he taught as part of the project. Blogging, as an online form of communication, has been around since before the millennium and yet its use by students in schools is by no means commonplace. If one way of looking at blogging is as a means of writing in the 21st century, should it not be the staple of every student’s education, as familiar to students as writing in an exercise book? I am a secondary school Head of English in an all-through school and if, as English teachers, we see it as part of our duty to support students to become functionally literate in the 21st century, then engaging them in (and educating them about) online forms of communication seems imperative. Originally conceived as a medium for individuals to express their thoughts and ideas to the world in a diary-entry form, blogging has since developed beyond this to include multi-user platforms where the format is more interactive and where there is opportunity for dialogue to develop. If we want to enrich our English students’ experiences by writing with a real purpose and for a real audience, then the opportunities that blogging can offer are as endless and varied as the World Wide Web. I have a class blog for all students that I teach. I currently use WordPress as it seems to be one of the easiest interfaces to use and navigate. Within a few minutes, a dynamic, interactive platform can be set up. Before using the blog with the class, I run through a blogging agreement with my students which explains the importance of being a ‘responsible digital citizen’. I like this phrase. It emphasises to students, who (in my experience) have not often thought about this, the idea that when we communicate online we need to be aware that it comes with different responsibilities to writing in an exercise book. I also like the importance of ‘community’ that is implied by this. I’m not sure where else in school students are being taught about this, but I feel it is my responsibility as an educator to do it. I begin with a welcome post on my class blog, stating that this will be a collaborative learning space with an emphasis on it being collaborative. Immediately, it becomes about ‘us’ and the fact that we are going to communicate with each other as a community of learners. I ask them to introduce themselves saying a little something about their previous experience of English and what they are looking forward to this year. I don’t tell them how to write; I just ask them to communicate their thoughts and feelings. Whilst a student may begin by directly addressing me with their initial comment, they quickly become aware that I am not the only audience of their writing. They soon realise that their peers are watching and reading too. Understandably, this can cause anxiety for some students at first. They have concerns over what to say and how to say it and worry about their accuracy, but at least they are concerned. Sometimes when students write in an exercise book they don’t seem to care at all. The communication soon starts to take on the form of a dialogue, full of dynamic and engaging interactions. They learn about each other, their interests, their experiences, their hopes and their worries. They are READING about each other. Weaker writers learn from stronger ones. They have become a community interested in learning and how we learn. In addition to this being hugely enjoyable and engaging for me, I am able to respond immediately and with greater efficiency than I might if I had a pile of 30 exercise books in front of me, wading through them one by one. The WordPress App on my phone notifies me when a comment is made. I can ‘like’ a comment; students appreciate this and they are familiar with it. A healthy competition starts to occur in which students want to improve their writing, making it more detailed and accurate. I don’t place too much emphasis on accuracy at first. As we all know from marking exercise books, this can be demoralizing and demotivating. Our first blog post had 131 comments on it within the space of a week. An extended dialogue developed between the group which wouldn’t have been possible in class time or within the confines of an exercise book and classroom. Hi, my name is Amna. I like playing football and I love reading books especially books by youtubers such as girl online and girl online on tour by Zoella (Zoe sugg) and Username: Evie by Thatcherjoe (Joe Sugg). I am most looking forward to writing poetry in English. I learnt several invaluable things from this about Amna and of particular interest to me as an English teacher was the revelation that you could read books by Youtubers. I felt like students were engaged and willing to share so much more via this medium of communicating than if had I asked them to do a similar task in their books. Adding on to that I am really excited to explore the library and the thing I need to work on is my spelling and my grammar. Also I feel I can work on my speech cause people say that I need to slow down when I speak and think my handwriting could be neater. Hi guys. How are you all? Today I am going to be talking about ‘The Godfather Of The Short Story’ (AKA Guy De Maupassant). His full name is Henri René Albert Guy de Maupassant. He was born on 5 August 1850 in Tourville-sur-Arques and he died on 6 July 1893 at the age of 42 in Passy, Paris. It is interesting how Amna has quickly become aware of her audience and without any instruction from me addresses her peers in a way which creates a positive tone and engagement with the task. It is also interesting how she says ‘talking’, not ‘writing’. It seems that students see this medium as synonymous with a form of online talk, creating an interesting blurring of boundaries between talk and writing. Some colleagues who I introduce to blogging are particularly anxious about this in that they worry about students’ use of Standard English when communicating online and blame the technology for all the errors that we see in their academic writing in class. I must admit that I see an increasing use of ‘your’ on social media platforms when someone actually means ‘you’re’ and perhaps this is having some impact on academic writing, but this is all part of language change and variation which has gone on for years. Isn’t it better to discuss these issues with students and the interesting point about why this happens, rather than simply dismiss or ignore what the technology can offer? My experience in poetry, in primary we did poetry in year 5 I think and I did one about a snowflake. Sometimes I need help in poetry because sometimes it doesn’t makes sense. I don’t read poetry that much but I would like to learn more a bit more of poetry. When I am bored I write a poetry to myself. I seen some poetry in TV an in YouTube. It’s kind of fun. For me I don’t put that much rhyme in my poetry. I think I use powerful words. I do a lot of errors in my work and in poetry. Poetry is very different to story’s but story’s do have poetry and in short storys as well. The thing that puzzles me about the poem is actually what another student Kaiden said which was ‘is this really a poem?’ This made me wonder a little bit. Is it? This made me think in to my knowledge of poems and I came to the conclusion that I am in fact not sure and would like to hear another student’s ideas to help decide mine. I like the end line ‘words can seriously harm your heart’. I like this because in a way it is true. Poems do have an effect on your emotions which is one of the things I love about poems. They can take you away from society and the real world. Blogging with students can provide so much more as an educator than the confines of a classroom and exercise book. It allows me to hear the voice of someone who I might not get chance to hear in class due to time constraints or fear of speaking out in front of others. It allows me to hear how someone is interested in what one of their peers thinks about their ideas. It allows me to support students in finding meaning together as a community of learners beyond the classroom walls. It allows me to engage my students in a medium of communication that is relevant to how they might already, and certainly will, function beyond school in the 21st century. To blog or not to blog? The answer seems obvious. In a future blog we’ll be sharing some of the other written outcomes that emerged from these poetry lessons, to consider the ways in which exploratory talk, group work and exploratory writing can contribute to the development of students’ confidence and ability to write analytically about texts.